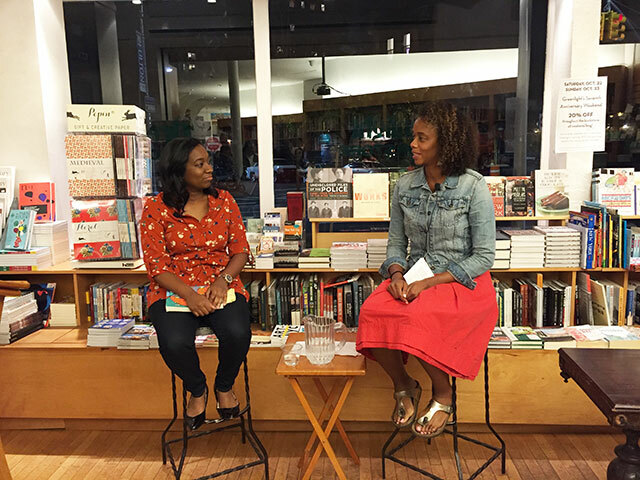 Brit Bennett discussed her debut novel, The Mothers, about a young girl dealing with recent suicide of her mother. She was joined at Greenlight Bookstore by Angela Flournoy, author of The Turner House. Flournoy begins the discussion by pointing out at that mistakes play a big role in the lives of Bennett’s characters. Bennett explained she herself was a bit of a cautious child growing up. A lot of things could separate her from her future, and that risk created a lens of anxiety through which she looked. Bennett says that when her parents were growing up, they had been poor. Her mother had grown up as a sharecropper, for instance. By the time her parents were raising her, their family was more financially secure but also had to sacrifice to get to the point where she was going to college. Those anxieties are also reflected in the threat of making mistakes. She is the first in her immediate family to have a passport and to have left the country. Leaving and getting separation from her hometown was a way to reflect on it. Much of the novel has a gossipy sense about it, a style that Bennett says she stumbled into. She set out to capture the idea of the church ladies because while they are respected and integral members of the community, they lack any real power. They are often paid lip service. “Gossip is an act of power,” Bennett declares. She liked the idea of these church ladies who had been dismissed by the other members of the community seizing their lost power by taking control of the story. A lot the novel is centered around relationships of women. While stories of female friendship is having a moment in popular culture right now, for Bennett that was a theme that evolved naturally in the text rather than something she set out to depict. Writing friendship in texts can be a bit of a challenge. Friendship doesn’t necessary have the same kind of shorthand or narrative queues for indicating people are growing closer together in the same way that a romantic relationship has natural progressions characters can follow. Illustrating a natural evolution of friendship becomes a challenge. The Mothers has elements of a coming of age novel, but transcends the form because the characters extend into adulthood. It is more multigenerational than coming of age stories typically are and Bennett says she is interested in different generations talking about each other. The book is also filled with lots of different kinds of mothers. Often the idea of motherhood is too simplified. For Bennett, she has a lot of personal anxiety over the fear of losing her parents.